The formidable prow of my trashboat veered toward a parked car. I corrected, and the whole thing lurched toward the oncoming lane. I corrected again and nearly lumbered straight into the curb in my own lane. I could see that this was going to be a very long half mile ahead of me, and I decided not to borrow trouble in thinking about the 6.5 mile ride back from Glow In The Dark Park just yet. 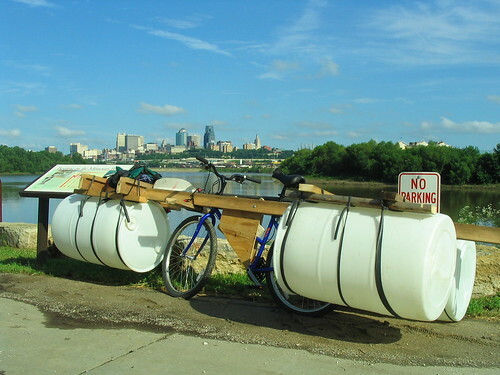 By the time I got to the bottom of the hill and had to make the turn to head out to Kaw Point, I’d gotten a little bit more of a grip on steering/riding/driving my craft on dry land, but not much of a grip when all was said and done. I pedaled, braked, wove back and forth, and offered up impassioned prayers to nonexistent gods that I might make it out to the Point basically unscathed. Backing things up to the beginning, I guess I could say these shenanigans began last winter. 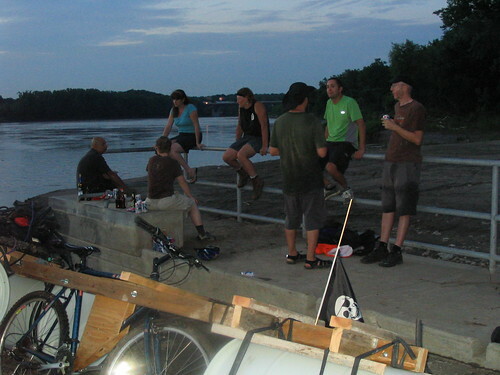 Unemployed, bored, and still regaining my grasp on reality after our coast-to-coast tour, I started daydreaming up events for the summer that could infuse a little more surreality and silliness into the admittedly already-colorful Kansas City cycling scene. 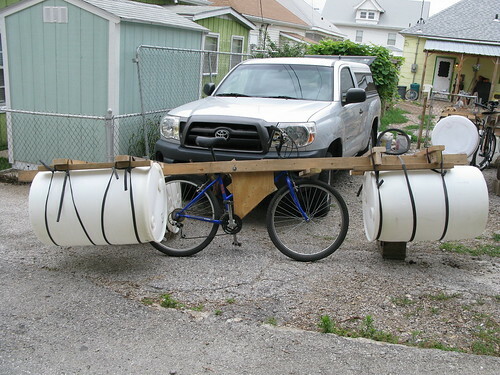 Inspired by the ChVnk 666 Aquachoppers and the Rat Patrol’s Trashboats I thought it would be an AWESOME idea if some of our local mad-inventors would build some boats out of old crap and we’d float ’em from one of our two local, accessible boat ramps to the other. 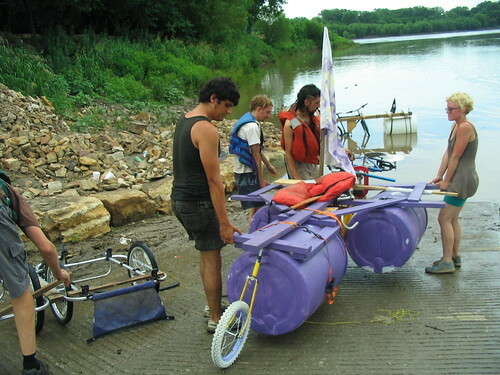 So I started combing the Internet for examples of amphibious bicycles, made a special page here at Meetzorp.com, and started telling people about my Big Idea. In May, I made some flyers and started handing them out, leaving them at bike and coffee shops, and generally hoping that would get the word out. I got a lot of questions and a few interested noises, but sadly a lot of folks who were interested also had commitments on the weekend of the Regatta. Ah well, there’s always next year! What we lacked in quantities of participants, we certainly made up for in enthusiasm. But to back up again, there was the build, which happened basically on Friday and a little bit on Saturday morning. Pretty much all day on Friday, Joel was cutting lumber and bolting it around bicycle frames. Two long spars sandwiched the main triangle, then a sort of pallet was built on the front and back of the spar to support the plastic 50 gallon drums that would provide our buoyancy. We bunjied the barrels to the racks with old, holey innertubes. 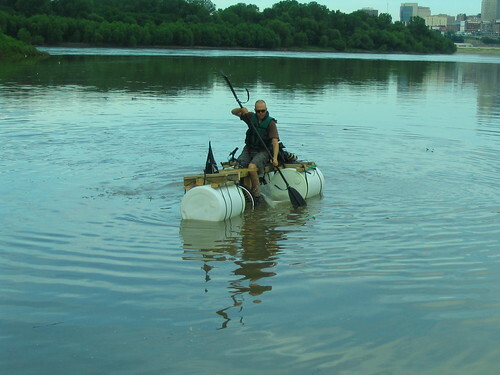 These crafts were cumbersome to ride but were gratifyingly stable in the water. 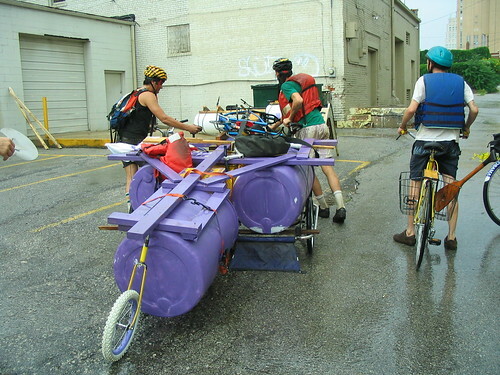 Because they were finished up within hours of the Regatta kicking off, we didn’t really get to test them out, aside from riding them up and down the street to the delight, confusion, or consternation of our neighbors, depending on their respective temperaments. At the zero hour, we weren’t sure how they’d behave out on the river. Fortunately, we had really good life jackets. Once we got to ACME, we got a phone call from Sean, our only other confirmed participant, letting us know that he and Idris were still bracing up their trailer, but would be on their way shortly. Ah yes, another crew as well prepared as we were, if not even less so…let the festivities begin! Yes, it was raining at that point in the day. The day had dawned overcast and the threat of rain was present all day. By 3:30, it was no longer a threat, but an actuality. By 4:30, however, the storm had passed, so we decided to press on. As per plan, I buzzed off for home to get my boat and to give Vargas the keys to the truck so he could get his kayak down to the river – oh yes, we’d arranged for him to leave his kayak at our house and use the truck to take it down to the Point. Eventually, much complicated shuffling of keys, tow-bikes, and responsibilities landed Andy with the job of taking a truckload of bikes & stuff down to Glow In The Dark Park. Somehow, it all worked out. I got to Kaw Point about 15 minutes ahead of the rest of the group and took the opportunity to reflect on the insanity of my choices and decisions. This all seemed like a perfectly cromulent idea back in February, but as I watched the branches, unidentified floating debris, and swirling muck course downstream, I started to have some economy-sized doubts. Fortunately, these guys showed up, and my worries evaporated like the puddles from the afternoon’s brief rain shower. I figured it would be readily apparent if we’d be riverworthy or not pretty early on. Joel put in and paddled around the launch area a bit. Success! The Deep Purple was launched next, and surprisingly supported all four occupants (snugly, but that wasn’t a surprise). Idris & Jeff perched on the front two barrels, Niki sat on the framework behind them, and Sean straddled the rear barrel, facing backwards. Sadly, I do not have a photo of this (yet) but Mike was out in his kayak with a disposable camera, so when I get those pictures developed, I will post them. I rolled in after the Deep Purple and had stowed my camera, double wrapped in zip-locks, just in case. I would take no more pictures until after we pulled out down at Glow In The Dark Park. Another politer, more official name for Glow In the Dark Park is Berkeley Riverfront Park, but it’s known by its alternative name to some folks who knew it before it was re-claimed and re-dedicated. It’s built on former brownfields land. Success! It smells like river mud. 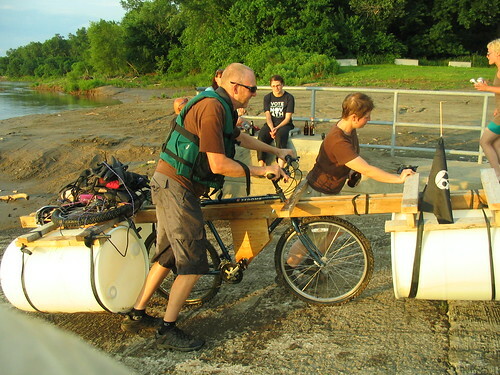 Joel & Melissa roll Joel’s piratical pontoon bike up the boat ramp. F.F. Deep Purple & crew celebrating their successful maiden voyage. Sipping on PBRs and watching the sunset…not a bad way to celebrate. 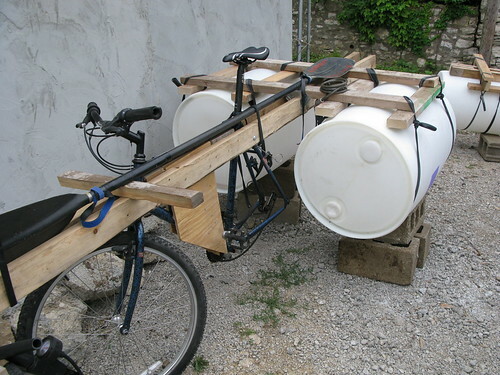 Well, in actual fact, I should have foregone my share of the PBR (one can, in fact, because I am a pitiful lightweight) because I found that I was spectacularly unable to pilot my pontoon bike back home. I couldn’t even get it out to the end of the driveway of the boat ramp. It veered, pitched, wobbled, careened, caromed, and generally went amok while I cussed, hollered, and fought to keep it upright. I ended up chaining it to a sign post and hitching a ride back in to town with Andy and Joel’s pontoons, which were removed from his bike for easier riding. We agreed to meet up for a very late-night dinner at Taqueria Mexicana on Southwest Boulevard, so after Andy and I dropped off the pontoons at home, we rode down to the Boulevard for some tasty, tasty Mexican food. Joel, Christi, Melissa, Jenny, and Mike were already there sipping on horchata and re-living the adventure. you guys absolutely rock – how cool! Thank you! It was also made out of 50 gallon drums. Next year it will be made out of soda bottles.